Why Appoint a Trust Protector? | The Levin Law Firm - Philip Levin, Esq. Why Appoint a Trust Protector? Clients often create long-term Trusts in their Will (commonly known as multi-generation Dynasty Trusts) in order to protect their beneficiaries from creditors, ex-spouses, estate taxes, and even themselves. Depending on state law, a Trust can have a perpetual term or an extended term, which can provide a family legacy for many generations. However, the problem with a long-term Trust is that it is not possible for the Grantor to anticipate future changes in the law and/or the family’s circumstances, which might require specific modifications to the Trust in order to better serve the needs of the beneficiaries. One way to allow the Trust to be more flexible (and to adapt to factual and legal changes) is to appoint a Trust Protector. A Trust Protector is a third party (not the Grantor, Trustee or Beneficiary) who is given the power in the Trust agreement to make changes to the Trust in order to carry out the Grantor’s intent. A lawyer or an accountant may often be a good choice to serve as a Trust Protector, with no compensation unless their services are required. Trust agreements can name the Trust Protector (and his/her successors). Alternatively, the Trust agreement may include provisions for the appointment of a Trust Protector, but defer the appointment until needed. For example, the Trust agreement can provide for the Trustee (or the beneficiaries) to appoint, remove and replace a Trust Protector. Under most state laws a Trust Protector is a fiduciary who, as such, is required to act in good faith with regard to the purpose of the Trust and the interest of all beneficiaries. While the inclusion of a Trust Protector is not mandatory, it may be advisable to provide for a Trust Protector to assure the intentions of clients who establish legacy Trusts are accomplished. 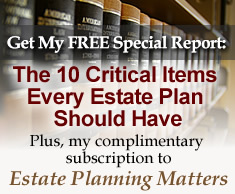 For more information regarding this topic and other estate planning matters, please email your requests to Philip Levin, Esq., or call Phil at (610) 977-2443. To learn more about how The Levin Law Firm can create an estate plan designed to help you and your clients achieve their wealth transfer goals, please contact our office to schedule a Complimentary Consultation at (610) 977-2443.